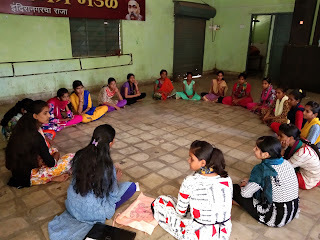 19-May-2018, Chinchwad (Pune): The Don Bosco Development Society (DBDS), Chinchwad organized a health awareness session for the adolescent girls residing in the Ajantha Nagar slum in Chinchwad. 22 girls participated in the session which was held under the aegis of “Health Risk Reduction Project” supported AXA Business Services. Ms. Lalita chaudhrai (Coordinator -DBDS) introduced the Resource Person to the participants and shared information about the project. 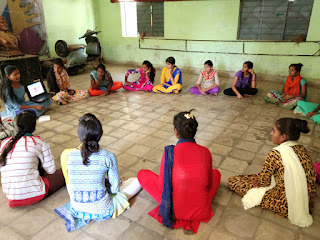 Mrs. Vidya Kale from Magic Bus NGO was the resource person for this session. 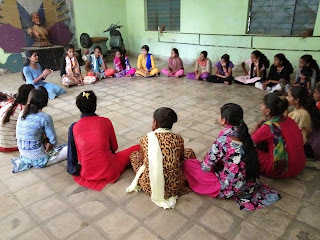 The objective of the session was to educate adolescent girls on personal health, hygiene, sanitation, menstrual cycle, diet and nutrition. 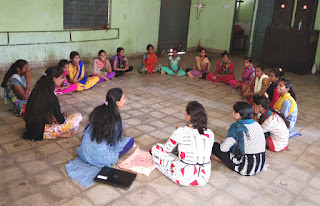 The resource person spoke about the reproductive system, physical changes, psychological changes, vulnerability to reproductive health risks, reproductive health rights, contraceptives, sexually transmitted diseases, sexual abuse, drug and substance abuse etc. She also spoke about the safe and effective birth control methods. After that she covered topics on risks of consuming tobacco. This was followed by a question and answer session in which the participants asked questions which were answered by the resource person. Mrs. Rajshree Deshkhaire (Staff- DBDS) did the logistical arrangement for this event and organized girls to participate in this session. After the session snacks was served to all and a Dettol soap was given to all the girls. Ms. Lalita chaudhrai (Coordinator -DBDS) proposed the vote of thanks at the end of program.